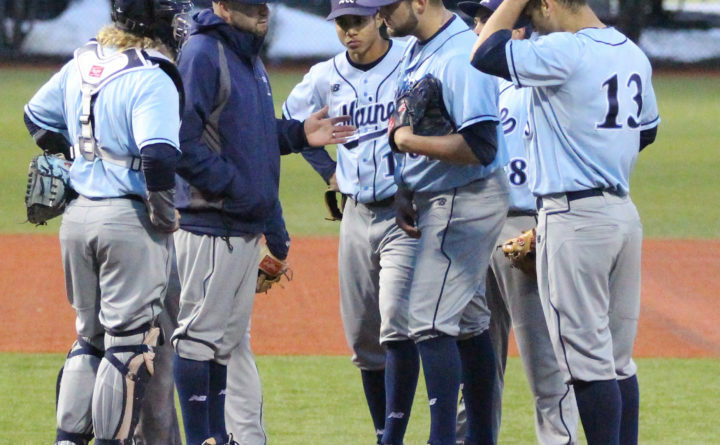 File photo from 2017 of University of Maine interim head baseball coach Nick Derba (second from left) confering with his players on the mound during a game. The Black Bears have clinched spot on home turf for the America East tournament. Ten days ago, the University of Maine baseball team was in last place in America East after losing to Binghamton 7-4. It was the Black Bears’ sixth straight America East setback. There were only eight conference games remaining and the Black Bears were faced with the potential embarrassment of missing the six-team, double-elimination tournament that UMaine is hosting May 23-26. The seventh (last-place) team fails to qualify. But the Black Bears rallied from a 2-0 deficit in the second game of that home doubleheader with Binghamton to win 4-2 and that triggered a five-game winning streak that has sewn up a tournament berth for them. The Black Bears swept three games in Albany last weekend, including an 8-7 Saturday triumph in which they erased a 7-1 deficit. With one weekend remaining in the regular season, UMaine could finish anywhere from first to fifth. The top two teams earn first-round byes but that is a longshot for UMaine. UMaine coach Nick Derba, whose team plays a nonconference game on Tuesday at Boston College, said he knows earning one of the top spots will be difficult. UMaine is in a four-way second-place tie with Stony Brook, UMass Lowell and the University of Maryland, Baltimore County. All are sporting 11-10 conference records. League leader Hartford is 14-7. UMaine (17-29) hosts Hartford for a doubleheader on Friday and a single game Saturday. The Black Bears have to win all three and receive help to finish first or second. That’s because UMaine would lose the tiebreakers to Stony Brook, UMass Lowell and UMBC. UMass Lowell hosts Stony Brook for three this week and UMBC entertains sixth-place Albany (8-13) for three. Albany (8-13) must win at least one game to qualify because last-place Binghamton is 9-15. Albany owns the tiebreaker against Binghamton. UMaine lost its tourney opener last year but bounced back to win four games and reach the championship game where it was beaten by UMBC. Saturday’s 8-7 victory, capped by a two-run rally in the ninth, marked the first time since 2016 that UMaine won a game in which it trailed going into the ninth inning. “It didn’t surprise me that we were able to do that,” said Derba. “We’ve come from behind so many times. But we’ve also left the tying run on base (on several occasions). “That was huge. If shows we can get there and finish the job. It was a good feeling for us,” said Derba. Sophomore right fielder Hernen Sardinas, who went 7-for-14 with three doubles, a triple, three runs batted in and five runs scored at Albany, was named the America East Player of the Week. Derba will use several pitchers in Tuesday’s game including Eddie Emerson, Connor Johnson, Zach Winn, Peter Kemble and Ben Terwilliger. Junior right-hander Nick Silva, who has been both a closer and a member of the starting rotation, is battling a forearm strain according to Derba. John Arel, Cody Laweryson and Trevor DeLaite will get the starts in the Harford series. The Hawks took two of three from UMaine earlier this season.